Smart bicycle safety products are becoming more common, and I think it’s great. I especially like that the COSMO bike light provides several features that are fantastic for safety oriented road cyclists while allowing you to supply your own helmet. Aside from the obvious tail light, it also acts as a brake light, and turn indicator (via handle bar mounted buttons). As well as providing live tracking, crash detection and important person notification, if something unfortunate were to occur. The light isn’t new per se, but it is new to the US, and at ~$90 seems a reasonable price to pay for the visibility and feature set. 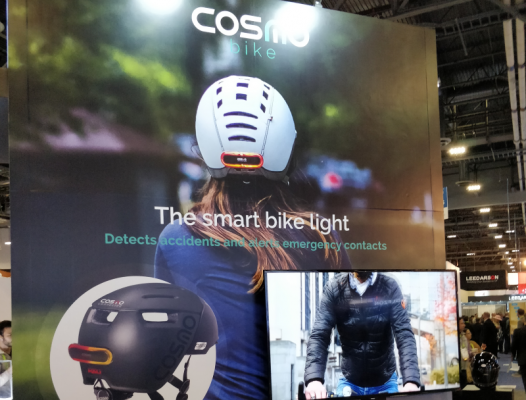 For those preferring an all-in-one solution COSMO is also bringing a series of cycling helmets to market with the light integrated. Interesting product. Would purchase it, but will need to see some hands on reviews first. Nothing was brought up on Google P1. I am hoping to get a review sample in.